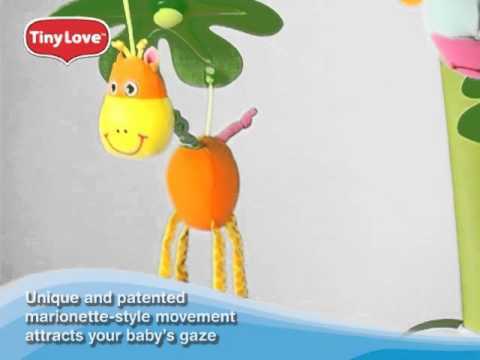 With multidimensional movement and tranquil music, the TINY LOVE Sweet Island Dreams Mobile entertains your baby and encourages important developmental skills. The green mobile arm resembles a tree with colorful branches that feature bright hanging island animals. A music box with a remote control offers continuous sounds for a soothing experience that engages the imagination. The eye-catching Sweet Island Dreams Mobile features an island-themed design with a vivid green tree at its center. Three puppet-like island friends--a giraffe, bird, and monkey--dangle from the branches and move to the music, captivating your baby's attention. The interplay between the music and the mobile's movement will fascinate and calm your baby, becoming a soothing and familiar part of the day. The Sweet Island Dreams Mobile will also help babies focus on objects, strengthen their eye muscles, and develop spatial perception. Built to play 20 minutes of continuous music, the Sweet Island Dreams Mobile keeps babies entertained and soothed while they fall asleep or play in their cribs. The tunes include four melodic tunes, two classical-themed and two nature-themed. The music box at the base of the mobile attaches securely to most standard cribs with an easy-to-install knob. The music box features four buttons to switch between the songs, helping babies discover the cause and effect associated with hitting the buttons. The music box also operates by remote control. The sweet monkey on the music box doubles as a glowing night light and can remain in place on the crib once the moving parts are removed. Trusted by parents worldwide, TINY LOVE creates toys and products for babies by pairing the latest breakthroughs in child development with quality materials and design. Each product is crafted after consultation with child development experts, quality assurance specialists, and parents. TINY LOVE is passionate about providing parents and caregivers with resources to better a child's early development. For example, the TINY LOVE Developmental Center, a virtual space to share knowledge about child development. TINY LOVE's 7 Elements System categorizes the specific facets of a baby's development that is at the heart of each TINY LOVE product.